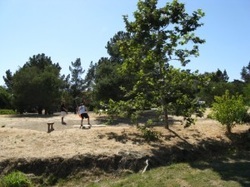 Lionel was on hand with trees long before the establishment of the disc golf course in 2003. Uncertain of the future use of the course in the 90’s, the area was planted with a mixture of drought tolerant oaks in the dry areas, sycamores alongside the seasonal creek, box elders, and incense cedars. Some reaching heights of over 20 feet, the trees now provide welcome shade to golfers, as well as sometimes unwelcome obstacles for their discs. The golf course was well-designed to utilize the trees in a varied and challenging course and is thoroughly enhanced by the added dimension of the planting–at times it is necessary to ‘tee off’ through a narrow gap, or ‘put’ under a low canopy. More projects are planned for the area to further vegetate the stream bed. Stay tuned for updates!